The network-ready Panasonic DP-8060 is a multifunction device intended for medium to large-sized offices. This device can deliver a maximum print resolution of 1,200 x 600 dpi and copy and fax resolution of 600 x 600 dpi. It is integrated with 32 MB of memory and a 40 GB hard drive. The Panasonic DP-8060 digital imaging system can handle media as large as an A3 and since it has a flatbed scanner it can copy and scan originals such as objects and books. Internet fax is offered but walk-up fax is optional. This large model comes with a 70-sheet automatic document feeder and can handle more than 6,000 sheets at a time. For connectivity, an Ethernet port is available. The Panasonic DP-8060 digital copier has a print and copy speed of 60 ppm and has a 33.6 kbps fax modem speed. The DP8060 monochrome copier has standard duplexer for automatic double-sided printing. The capacity of the original black Pansonic DP8060 copier toner is approximately 37,000 pages. 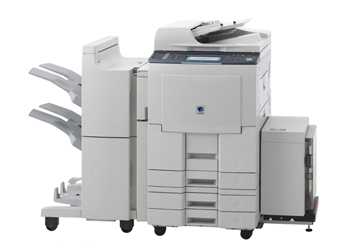 The robust DP-8060 laser copier is great for heavy-duty printing and copying. This reliable device can deliver crisp and professional prints and copies. It has good security features including network user authentication and HDD overwrite. Workgroups favour the black and white Panasonic DP 8060 copier as it has Ethernet and it works on both Macintosh and Windows operating systems. Aside from the standard ADF, this model also has an inverting ADF plus a network scanner. The Panasonic DP-8060 laser printer cannot be upgraded with Wi-Fi capabilities. This model does not come with standard walk-up fax, but i-Fax is built-in.